was it a dream or a …. I made this quilt at the start of the year for the Qld SOTA 2015 exhibition, it was accepted and is currently travelling around Queensland.Its my first quilt to be accepted in to an exhibition as till now I have simple shown my quilts in local art galleries. I received the background fabric in a swap during 2014 and knew immediately the quilt I was going to make with it. 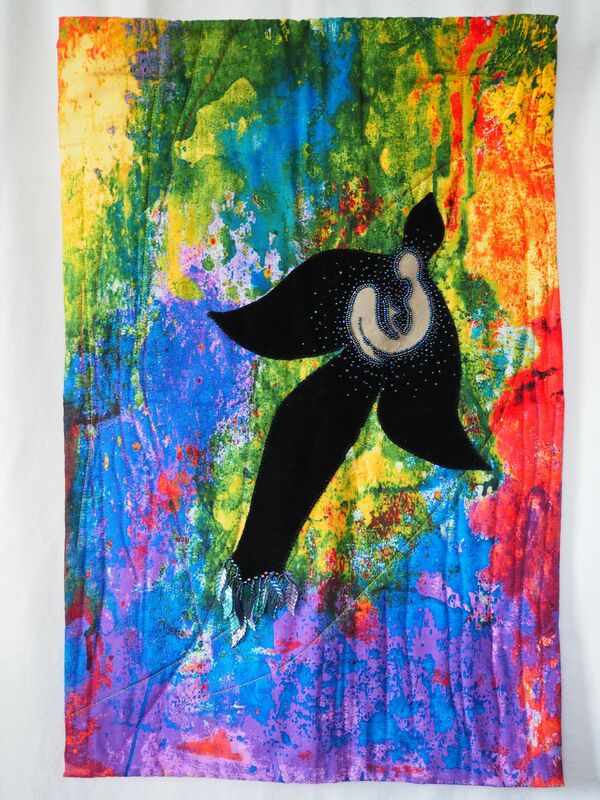 Altered mental states be they from dreaming,trances,mental illness or drugs is something I’ve been exploring for sometime.In this quilt the dreamer is represented as the female flying within the black dream bird ,across a vividly coloured world. Within art ,birds are often used to represent the dream state .The sense of flying that some experience while dreaming is thought to be the reason.Now for the tricky bit,she is flying on a black dream bird across vivid colour so is she dreaming black & white or in vivid colour and don’t ask me because at this point I have no idea.The fact that some people dream black & white ,while others dream in colour has always fascinated me and that is one of the questions I was playing around with while I made this quilt.Yes Im sure I haven’t explained this clearly but Im not sure I can any clearer at this point.I often have silly questions/ideas buzzing around in my head and this quilt is to do with the colour verses black & white dream state. 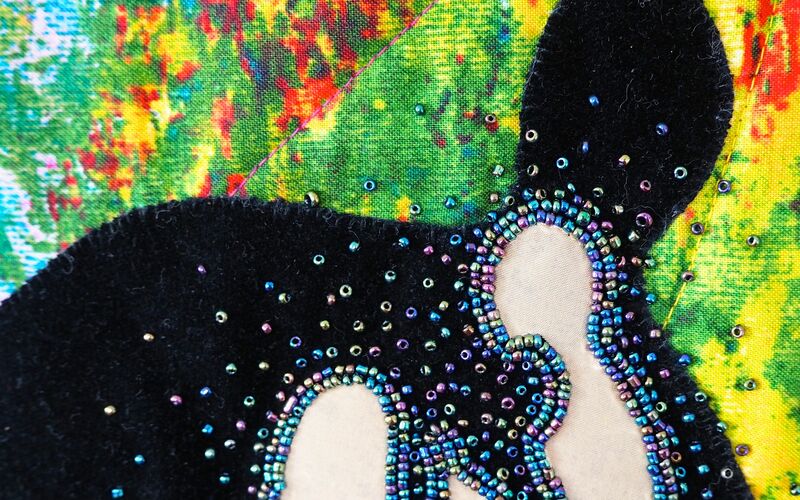 Techniques used were machine quilting on the background with the dreamer & the dream bird both being fused firstly then hand appliqué .Before the bead embroidery was done.